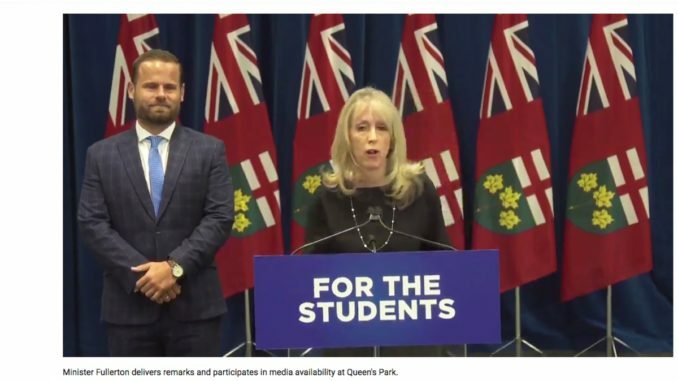 Last Thursday, Training, Colleges and Univeristies Minister Merrilee Fullerton announced sweeping changes to the way the Ontario Student Assistance Program (OSAP) will work in Ontario beginning September 2019. In a move Fullerton says will further help students save money the government has cut Ontario’s tuition fees by 10 percent. These cuts coincidentally will help the government trim what they say is a $14 billion dollar deficit. This announcement however has been widely criticized by student advocates as detrimental to students who come from low income backgrounds and in terms of the quality of education and services they will receive. According to Fullerton, college students will save on average $340 dollars annually and university students will save $660 dollars. Universities say they will lose around $300 million dollars while colleges say they will lose $80 million per year. The government has not increased subsidies to offset the losses. The province insists that tuition fees make up only 2 to 3 percent of an institution’s operating budget, a figure which the colleges and universities dispute. The schools say that tuition actually makes up one third of their funding and a 10 percent cut will lead to larger class sizes, overworked teachers, dirty facilities and a lack of student services and clubs. The government has also made certain student fees optional. Under this new OSAP the only fees which will continue to remain mandatory are campus walk-safe programs, health and counselling services, academic supports, and recreations and athletic programs and teams. So hypothetically a student could chose not to support a school’s cultural program, the gaming club or the LGBT club. There’s also been changes to who can apply for financial assistance. Under the previous Liberal government students who came from families which made $175,000 could apply for OSAP funding. The new limit has been lowered to $140,000 per family. The free tuition program brought in by the Wynne government was made up primarily of grants. Students whose families made under $50,00 were eligible for grants. Under this new funding model the majority of those funds will now be loans which will have to be repaid. And since these loans have to be repaid, the fact that OSAP has eliminated the 6 month grace period for repayment has not gone over well. So once graduation happens interest on those loans starts to collect immediately. Activist say that this change will hurt graduates as students who cannot find a job immediately after school will be put under the pressure of increasing interest from their student loans.